two areas where it didn't take too much work to bring color and life to the rooms. I just needed to help it come out of hiding! 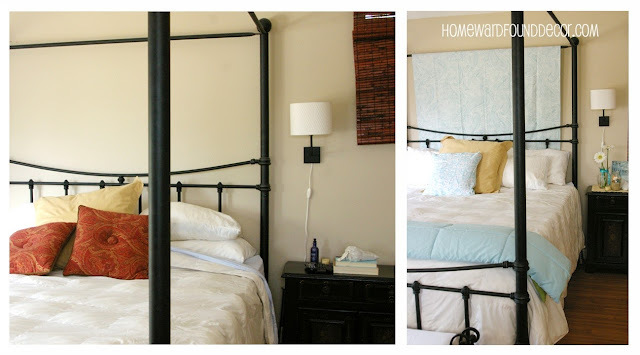 The walls are soft mocha, the bed is a sculptural black iron, and the other furnishings are black wood. A perfect neutral palette to start with. and red is not a color that cools you off in the summertime! but every time I looked at it, it felt like an old air conditioner was hidden behind it! which I found brand new in its bag in the living room buffet drawer. this softens the look of the bed - which is all angles. that pillow on the bed is covered with... a shirt. so I simply wrapped it around the pillow. Call it furoshiki! The thing is, that shirt is MINE! but I like that shirt and wasn't prepared to give it up for their decor! So I just used it for the photo. that shirt had enough fabric to become a pillow cover. You could also use a table runner, or a few placemats, to make a pillow cover. Whatever you use, it's just FABRIC. Be open to looking everywhere for elements to use! which makes the window itself look less like an air conditioner is hiding behind it. This also echoes the length of the blinds on the large front window for a more cohesive look. I also found a light aqua twin-sized comforter under this bed. 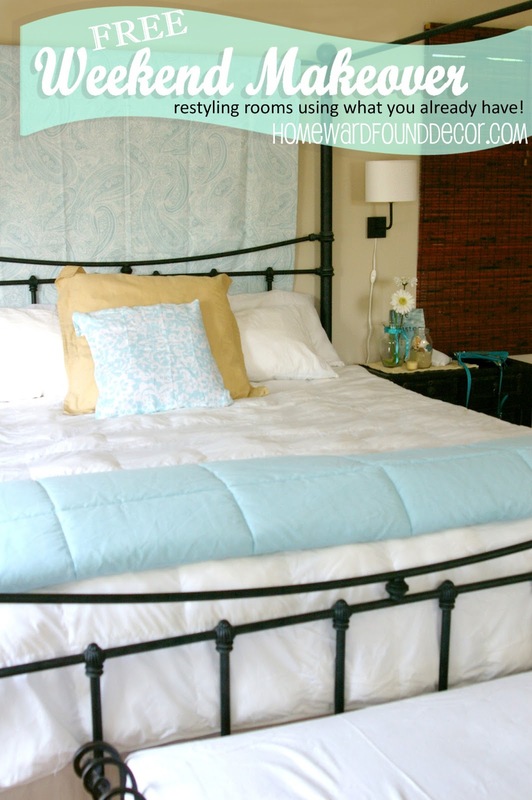 adds a splash of color to the room and coordinates with the headboard treatment. 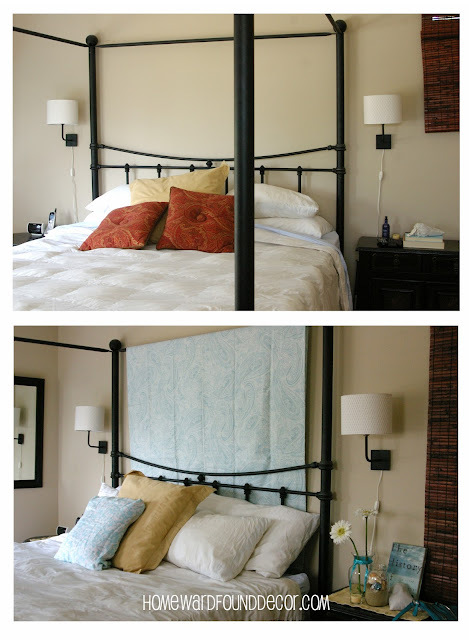 A vase of flowers on the bedside chest makes the hanging lamp cord less noticeable. I'd paint it the same color as the wall, if it were my room. On the other side of the room, a small round table is swathed in that dark red brocade fabric. HEAVY. Hot. And NOT the kind of hot and heavy you want in the bedroom! their sandy color matches the Euro pillow on the bed. A few books with blue covers pull the color scheme over here. completely alters the way the painting on the wall looks?! With the red tablecloth, the red tile roofs in the painting jump out at you. which brings the 'visual' temperature in this room down quite a bit! after covering its dark red cushion with a white curtain panel. Honestly? I just did it for the photo. "I'll KILL myself on that thing in the middle of the night!" The things I did in this room were fast and easy - not intended to be permanent. I just wanted to show them a new look using what they had. so that she can sew a new tablecloth, cushion cover, and accent pillow covers for this room. She may even paint a wall blue, using the paint from downstairs! of the top of a bedside chest, and the table in the corner. and a fabulous turquoise mini-purse that I just had to throw into the photo! 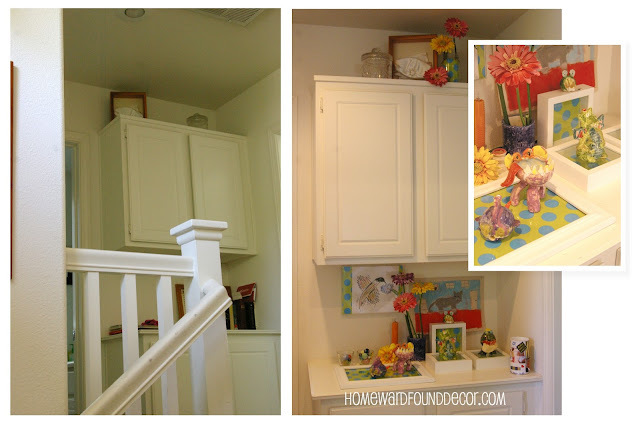 the hallway landing is home to a laundry closet and this cabinet area. and the cabinets store a plethora of family photo albums. I thought it would be a perfect area for an 'Art Gallery'. that has a piece of gift wrapping paper lining it. then used them as a tray and stands that hold the whimsical clay creatures. and also fill a glass vase lined with the wrapping paper up on the top cabinet, to coordinate the look. their bedrooms, and now the hallways. and hung them on the backside of the fireplace in the living room at the bottom of the stairwell. and not just a decorated showplace. from the viewpoint at the edge of the kitchen. while using stuff they already had. OK, some of you commented "So tell us what they thought!!!" They entered through the front gate, saw the front deck, looked at each other, then laughed. I thought 'uh oh'... and then sis started just GUSHING about the patio and deck. Actually, they ALL started gushing... my brother and nieces included. They walked all over outside, exclaiming and smiling. "OH MY GOD, IS THIS MY HOUSE???!!!!" while the girls were running all over looking at everything at once. "I'm not changing a thing. We gotta' have a party to show this off!" and they both said "It's PERFECT! BEYOND perfect!" that their devious PLAN had been for the whole family to walk in and look unhappy. To act as if they really, really hated what I had done to their house. But as soon as they saw it, they were SO HAPPY that they couldn't fake being otherwise! ...and then they took me out for a terrific dinner! 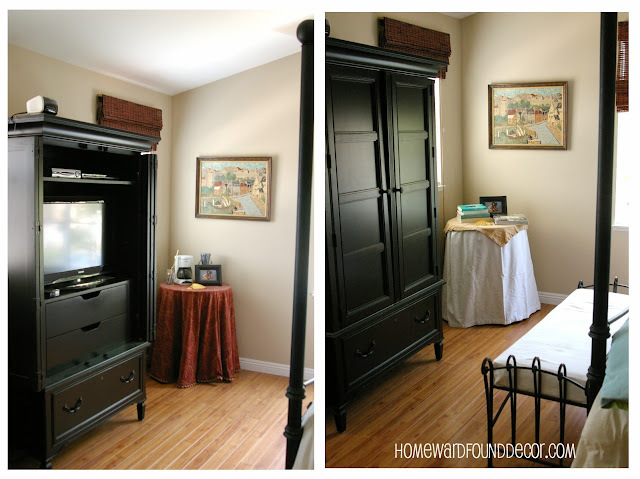 to refresh your own rooms using what YOU have on hand! Un-Freaking-Believable! Seriously....Amazing! So.....will you be in the Pensacola, FL area anytime soon? Free room and board, just sayin'!